Alexis Gritchenko (the French spelling of the Ukrainian Oleksa Hryshchenko) was born in Krolevets, Northern Ukraine, on April 2, 1883. While studying philology and biology at the Kyiv, St. Petersburg and Moscow universities, he became interested in painting and went to study at the Moscow Art School. There he played a significant role in the modern art movement, and had close ties with the important art collectors, Stchukin and Morozoff. In 1911 he traveled to Paris where he met Andre Lothe, Alexander Archipenko and Le Fauconnier, and became an enthusiast of modern painting, especially cubism. In 1913-1914 he studied in Italy concentrating on Italian primitives. He published several books and articles, the most important of which were his studies on the icon in relation to Western art, and also took part in contemporary discussions on various aspects of modern art. During the Russian Revolution, Hryshchenko became professor at the State Art Studios in Moscow and a member of the Commission for the Protection of Historic Monuments. He was offered the directorship of the Tretiakov Gallery, but in 1919, not wishing to became a state functionary, he escaped by way of Crimea to Constantinople, leaving all his paintings and other possessions in Moscow. In the Tur5kish capital, he lived a life of extreme poverty, but never ceased to paint and his watercolors of that period soon made his name famous in the art world of the twenties. He made the acquaintance of the American archeologist and collector Thomas Wittnore, of Boston, the restorer of St. Sophia, who acquired 66 of his water colors. This enabled Hryshchenko to make a trip to Greece where he painted in Mistra, Delphi, Corinth and Olympia. In 1921, when he came to Paris, 12 of his Constantinople paintings were accepted by the Salon d'Automne, and Fernand Leger placed them next to his own works. After his second trip to Greece in 1923 and an exhibit at the Byzantine Museum in Athens, the art dealer Paul Guillaume introduced him to Dr. Barnes Zborovsky, another well-known Paris dealer, and Dr. Barnes acquired 17 of Hryshchenko's paintings for his collection, now the Barnes Museum in Merion near Philadelphia. After 1924, Hryshchenko lived in France. In 1927, he married Mile Lilas Lavelaine de Maubeuge, and settled in Cagnes, where Renoir once lived. At that time he had already changed his style from cubist toward an explosive color expression. Here he was obviously influenced by the Riviera sun, sea and mountains, and his heavily applied paints and dramatic colors were an expression of the inner unrestrained forces of a painter who was striving to transform nature according to his own image. After the exhibition at the Bing Gallery, 1926, Louis Vauxcelles wrote that: "the young Ukrainian colorist conquered Paris." Katia Granoff acquired 24 of his oils and exhibited them in her gallery. 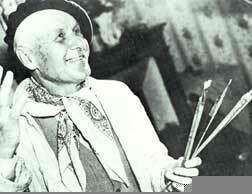 Hryshchenko made frequent trips to Spain, Purtugal, England and Scandinavian countries, and the paintings he brought from these places he exhibited in leading Paris galleries: Paul, Guillaume, Bing, Granoff, Druet, De l'Elysse, Weil, Bernheim-Jeune, and in the large Salons, especially the Tuileries and d'Automne (member since 1930). In 1937 he had a one-man show at the Ukrainian Museum in Lviv (Lvov), then under Polish rule, where his first Ukrainian-French monograph appeared. Hryshchenko's works are found in various museum and private collections, more than three hundred of them in USA and Canadian collections. At the beginning of the sixties it became known that Hryshchenko's paintings which had been in the collections of the Ukrainian Lviv Museum were destroyed as creations of 'bourgeois formalism', together with works of Archipenko, Boichuk and Narbut. This induced him to bequeath a collection of 70 oils and watercolors to the Alexis Gritchenko Foundation in New York with the provision that they be transferred some day to the museums of a free Ukraine. The Foundation is located at the Ukrainian Institute of America in New York, where a retrospective show of his works were organized by the artist's friends in 1958. After 1958, Hryshchenko held three more exhibits in New York and Philadelphia, the last taking place in 1967 at the Peter Deitsch Gallery in New York. Hryshchenko died in Vence, France on January 28, 1977. Besides his books on art printed before Russian Revolution, Hryshchenko is the author of 'Two Years in Constantinople', a journal published in 1930 in French with 40 color reproductions of his watercolors. He wrote several books of memoirs, among them a swries of articles describing his encounters and conversations with modern French artists many of whom were his friends. Two monographs of his art work appeared in France in 1948 and 1964. The celebrations commemorating his birth pay homage to an artist who united Eastern and Western painting ideals while stamping his works with his own unique talent and personality. This exhibition is organized by the Gritchenko Foundation and the Ukrainian Institute of America. Fifteen paintings are from the Foundation's collection, and the remaining works are on loan from New York and Philadelphia collectors.